Tennessee's Jaime Nared (31) shoots ahead of Boise State's Kayla Reinhart (42) in a game in Knoxville. 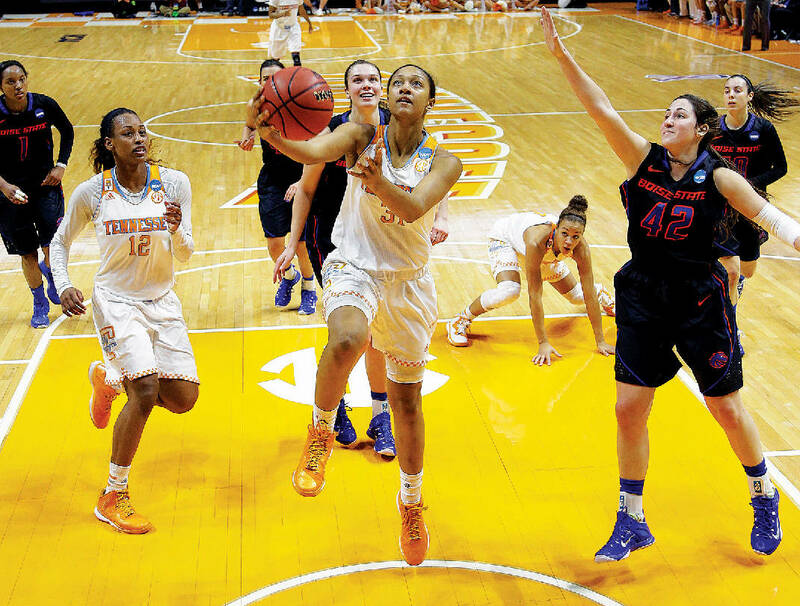 The Lady Vols are hot going into the SEC tournament. South Carolina is looking to extend its impact at an event traditionally known as the Tennessee Invitational. The 38th Southeastern Conference women's basketball tournament will tip off today at Bon Secours Wellness Arena in Greenville, S.C., and Dawn Staley's Gamecocks again are the team to beat. South Carolina is the top seed after winning its fourth consecutive regular-season title, which matches the feat of Pat Summitt's Lady Vols from 2001 through 2004, and the Gamecocks are seeking a third straight league tournament title, which is something only Tennessee has accomplished as well. "I like where we are," Staley said in a news conference following Sunday's 95-87 win over visiting Kentucky that capped a 24-4 (14-2 SEC) regular season. "I like the fact that our players are loose. I like that we can play a variety of ways. We can play fast. We can play slow and pound the ball inside. "We're finally trying to hit our stride, and that has come with a balance on the perimeter and the post." The SEC tournament will begin this morning at 11, when 12th-seeded Alabama (17-12, 5-11) faces 13th-seeded Vanderbilt (14-15, 4-12). That game will be followed at 1:30 by No. 11 Florida (14-15, 5-11) taking on No. 14 Arkansas (13-16, 2-14). South Carolina's fourth straight title came at the expense of Mississippi State (27-3, 13-3), which led the league until losing its last two games against Kentucky (20-9, 11-5) and Tennessee (19-10, 10-6). Vic Schaefer's Bulldogs hosted the Lady Vols on Sunday before a sold-out audience of 10,500 at Humphrey Coliseum, but Tennessee 6-foot-2 junior Jaime Nared racked up 30 points and nine rebounds in helping administer an 82-64 shellacking. "We were beaten in all the toughness categories, and that is not what our program is about," Schaefer said in his news conference, "but credit Tennessee, because they have been playing well as of late." Mississippi State has never won the SEC tournament, losing last year's championship to South Carolina and the 2000 final against Tennessee. The 2000 tournament was the seventh and final tournament to be held at Chattanooga's McKenzie Arena. Schaeffer was accurate in his assessment of the Lady Vols, who will enter Greenville on a three-game winning streak and having topped South Carolina and Mississippi State on the road. Tennessee fifth-year coach Holly Warlick used the box-of-chocolates analogy from "Forrest Gump" after the win in Starkville, but the potential of Nared stepping up and complementing Diamond DeShields and Mercedes Russell may catapult Tennessee to the team nobody wants to face. "We can get ourselves in and out of any game," Warlick said in Starkville. "If you look at the games where we've played well, we've played together." Tennessee has an all-time record of 77-20 in the SEC tournament with 17 championships, with its most recent title occurring in 2014. The next three programs — Vanderbilt, Auburn and Georgia — have combined for 14 SEC tournament crowns. ESPN analyst Charlie Creme has seven SEC teams comfortably in his projected 64-team NCAA tournament field: South Carolina (1 seed), Mississippi State (2), Kentucky (4), Missouri (5), Tennessee (6), Texas A&M (6) and LSU (8). Auburn also is in Creme's bracket but as an 11 seed and as the last team selected. The Tigers (17-13, 7-9) are seeded eighth in the SEC tournament and will face ninth-seeded Georgia (15-14, 7-9) in Thursday's first contest, which could wind up determining whether the league has seven or eight NCAA representatives. Georgia is not listed among Creme's "First Four Out" or "Next Four Out," so Joni Taylor's Lady Bulldogs likely would have to knock off Auburn and top-seeded South Carolina on Friday to warrant NCAA tournament consideration. This has been a winter to forget for Florida, Vanderbilt and Arkansas. Amanda Butler's Gators will have to win twice in Greenville to avoid having a losing record in a season that began with a No. 20 ranking in the Associated Press poll. Vanderbilt competed in 22 NCAA tournaments in a 23-year stretch under former coaches Jim Foster and Melanie Balcomb, but Balcomb's last two Commodores teams went 10-22 in league games. This will be the first SEC tournament for Vandy coach Stephanie White, who came to Nashville after coaching the WNBA's Indiana Fever. Yet no SEC team has struggled more this season than Arkansas, which enters Greenville on a 10-game losing streak. "At the end of the year, we'll look back at the turnovers and the free throws and realize that we haven't been very good in either area," said third-year coach Jimmy Dykes, who is 15-33 in SEC games. "We've had too many turnovers and missed way too many free throws in close games. We have to lead this league in the number of losses by five points or less or 10 points or less."